Today, millions of women and girls around the world enjoy running and entering races. It wasn't always so: * In 1961, when Julia Chase edged to the start of a Connecticut 5-miler, officials tried to push her off the road. * At the 1966 Boston Marathon, Roberta Gibb hid behind a forsythia bush, worried that police might arrest her. * The next year at Boston, Kathrine Switzer was assaulted mid-race by a furious race organizer. * In the mid-60s, Indianapolis high schooler Cheryl Bridges was told not to run anywhere near the boys' track team because she might "distract" them. * When Charlotte Lettis signed up for the University of Massachusetts cross-country team in the fall of 1971, she was told to use the men's locker room. * A few years later in coastal Maine, young Joan Benoit would stop her workouts to pretend she was picking roadside flowers, embarrassed that her neighbors might spot her running. 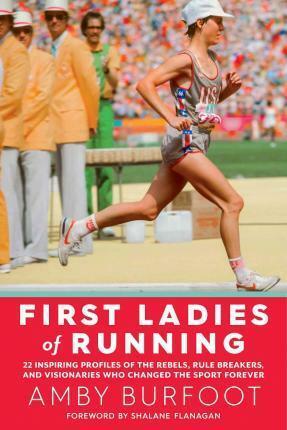 First Ladies of Running tells the inspiring stories of these and other fiercely independent runners who refused to give up despite the cultural and sports barriers they faced. Legends such as Doris Brown, Francie Larrieu, Mary Decker, Jackie Hansen, Miki Gorman, and Grete Waitz are chronicled by Runner's World editor Amby Burfoot. Burfoot even runs the 1994 Marine Corps Marathon with Oprah Winfrey, whose successful finish opened the floodgates for other women runners. First Ladies of Running is a beautiful and long-overdue tribute to the pioneers of women's running, and a gift of empowerment for female runners everywhere. "First Ladies of Running is filled with inspirationalstories of the courage, endurance, determination and rebellion of the pioneerwomen runners. Whether or not my 5-year-old daughter chooses to run, I willread her the heroic stories that fill this book." -- Deena Kastor, bronze medalist, 2004Olympic Marathon; American record holder in the marathon "This isn't a book just for women. It will also be enjoyedby the many men, like me, who shared the roads with the remarkable pioneerrunners. It's especially great for those of us with daughters, who we hope willfollow the healthy running lifestyle." -- Bill Rodgers, four-time winner, Boston Marathon; four-timewinner, New York City Marathon "First Ladies of Running is a must read for runners andwomen everywhere. The stories here--from Doris Brown to Joan Benoit--will staywith you through your miles on the tracks, roads, and trails of life." -- Mary Wittenberg, CEO, Virgin Sport; former CEO and RaceDirector, New York City Marathon "This was the best book that I have read in a long time....Aside from general facts, Burfoot's firsthand experience with these athletes and their events makes for entertaining storytelling..., readers will feel like they are on one of those euphoric runs and will not be able to put 'First Ladies of Running' down. Burfoot's book should be put right alongside any major historical running book...joining many others who have masterfully woven the history of Sport from their perspective. Burfoot not only rewards us with that perspective, but also his laser-like focus which has brought him success as in the past." Amby Burfoot has been a Runner's World editor since 1978. He won the 1968 Boston Marathon, has run more than 110,000 miles in his life, and is the author or co-author of six previous books. He lives in Mystic, Connecticut.